Oh ya’ll. Last week was one heck of a week around our house! So much so that I am actually a few days late getting this post up! I spent the majority of this past week asleep or in bed with a virus or something. I’m not quite sure what I had going on, but I do know that I felt somewhere between “ugh” and “man-flu.” 😀 Despite not feeling well, we were still able to continue with our 2019 financial goals and live frugally for another week. Luckily, once you’re living on a budget, living a frugal life isn’t too terribly hard to do. If you are new to Six Dollar Family, my own family is working on picking up the pieces of a shattered emergency fund with our January 2019 budget. We’ve also set some pretty lofty 2019 financial goals for our family. This means we’ve had to really crack down on how much spending we’re doing. 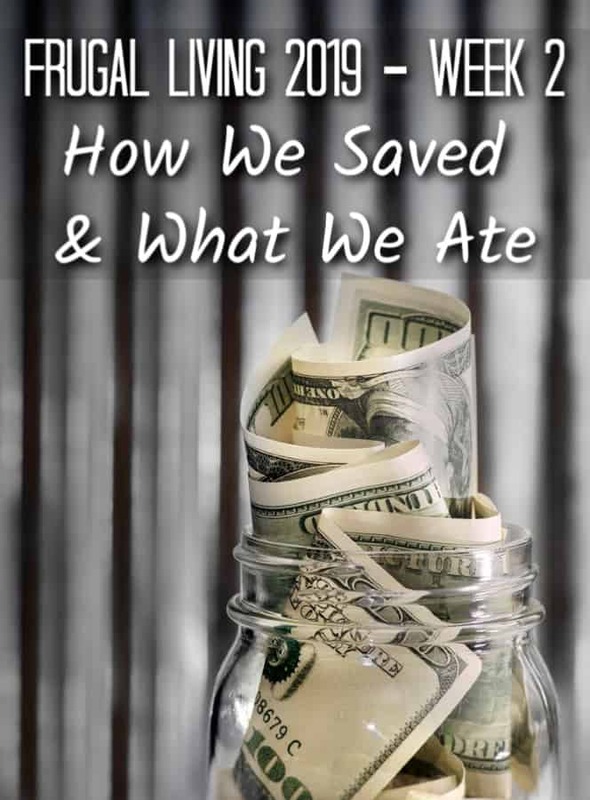 While I was doing my 2019 blog planning, I decided it would be fun to share with you each week how we save. I will also be updating our budget monthly as well as updating those financial goals throughout the year. Last week, I shared how I scored amazing deals on clearance produce in my living frugally in 2019: week 1 post. Most of it has been used up or frozen at this point. We still have a few baking potatoes left which will get used later this week as a breakfast or dinner. We are working very hard to find ways to become a zero waste home so I refuse to allow them to go to waste. I’m thinking I may just shred them and use them in my bacon, egg and cheese casserole recipe for a yummy lunch this weekend. If you’re wondering, yes, I do menu plan but because both of my girls are not really breakfast people and I am the only one home during lunch; I only plan dinners. This past week was a doozy like I mentioned above, but that didn’t stop me from making one of the best deals I have made in a long time! I am quite passionate about saving money when I am in “money crack down mode” and even a little blech feeling won’t stop me. One of my favorite ways to save money is by bartering. It’s super simple to do once you get the hang of it and if we can barter even one item a month for something we need; we will save quite a bit of money before the end of the year. This week, I made our first bartering transaction of 2019 and I could not be more thrilled! I love to sew – although I am still learning and quite the beginner – but needed to pick up a new sewing machine. I really did not want to spend $100 or more on a quality machine so I have been holding off on buying it. I am so glad I did! Two weeks ago, my daughter Emma came to me and told me she was no longer interested in playing her electronic music keyboard. To be honest, I am quite okay with that since she really only began learning to please me. 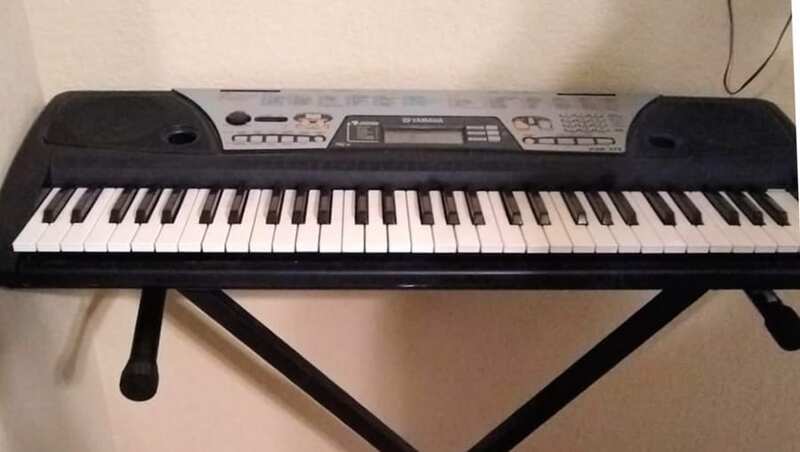 She loves music and is quite the vocalist but she had no desire to ever learn piano. She and I made a deal that if I sold it for cash, she would earn a few dollars off of the sale. However, if I bartered it or was unable to sell it, she received nothing on the deal since Mom was the one who paid for it in the first place. It wasn’t long before I had an offer that both Emma and I could live with! 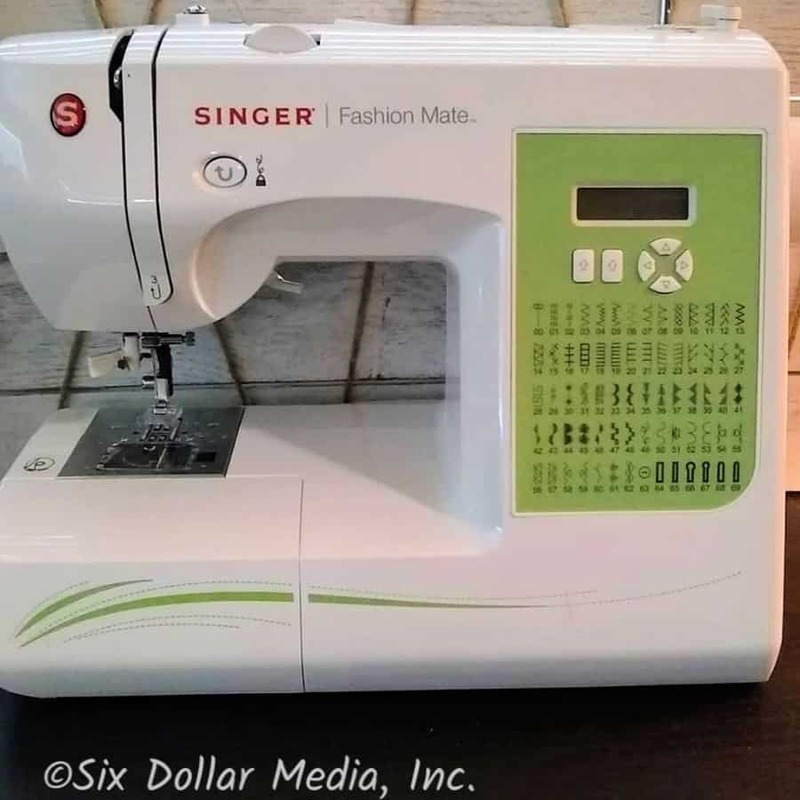 We were able to trade her keyboard for this Singer Fashion Mate sewing machine even up! The very nice lady we traded with did not pay us a dime nor did we pay her anything. This sewing machine sells for as much as $150 on Amazon! It works perfectly and the only thing I will need to pick up for it is spool caps making it a fantastic trade for us! I will be heading over to Craftsy/Blueprint to pick up a few online sewing classes in the next month or so to help me brush up on my skills. In our home, we use a lot of reusable cloth products – including cloth menstrual pads – to save money. Having a sewing machine on hand will not only allow me to make things for fun, but I’ll also be able to skip buying those cloth products and make them myself. We make a lot of things homemade instead of buying them and now I can add cloth menstural pads, unpaper towels, cloth mopping pads and more to my list! This week has been the week of Prime Pantry sales and boy have I used those to my advantage! Right now, Amazon has a sale happening on certain items where you will save $6.00 for every 5 items you purchase. The catch is that you can only do the promo once for each transaction. There is nothing that I have been able to find saying you can not do more than one transaction so I may or may not have processed a lot of transactions this week. LOL. My poor bank probably thinks I’m insane. First, I know it seems like quite a bit of junk food. It is for the most part. It is, however, mostly snacks for Steve on the truck. He takes fruit and healthier food from home, but we all like a little treat once in a while. The OJ and Listerine is his as well. I make our own homemade mouthwash for myself and the girls, but it became too much trouble to keep him stocked with the homemade version on the road. The Quaker Oats will be eaten by me making different breakfasts like my homemade strawberries and cream oatmeal recipe. I love oatmeal as a quick breakfast and this deal was just too good to pass up! All in all, I spent $90.61 for 46 total items. That means I paid just $1.96 per item! I don’t know about where you shop, but I am not able to get anything on that list at any store for cheaper than $1.96 per item. I also found a killer deal on Cap’N Crunch cereal and picked up 12 boxes of it. Yes! 12! The cost of 12 boxes was $23.07 and I had $9.00 in gift cards I had earned that day from InstaGC which brought my total down to just $14.07. My final cost per box was just $1.17 each! Yes, I do need to earn Amazon gift cards to restock. I’ve used them lately to help cover the trucking products Steve needs for the truck so I’m running low. When you total it up, I spent $104.68 this week on 58 grocery items. That brings my final cost down to just $1.80 per item and is at least a 50% savings over what I could find in our local stores. Yes, I am super excited to save that much money on groceries! The Prime Pantry sale is still going on so if you want to grab some deals for yourself, you absolutely can. Be sure you consider that Prime Pantry has a delivery fee of $5.99. However, when you spend $10.00 before the discount, your delivery is free as long as you’re a Prime Pantry member. Keeping that in mind is super important to getting the deals you want. If you’ve never done so, you can sign up for a FREE 30-day trial of Amazon Prime Pantry right HERE to help you qualify for that free delivery with a $10.00 purchase. You’ll also score a $10.00 off $40.00 order coupon when you sign up! Once you’re signed up for your free Prime Pantry trial, head on over HERE to the Buy 5 Save $6.00 sales page. There are all kinds of items included in the sale including beauty, baby and grocery items. Take your time and figure out what the best deals for your family are. Ideally, get your total as close to $10.00 and checkout to save the most money. I personally found that for certain items it was cheaper to buy 5 of them all at once and for others it was cheaper to mix and match. I think that’s it for this (last) week! I’ll update you for this week on Saturday and we will be back on track! Stay healthy and stay warm!